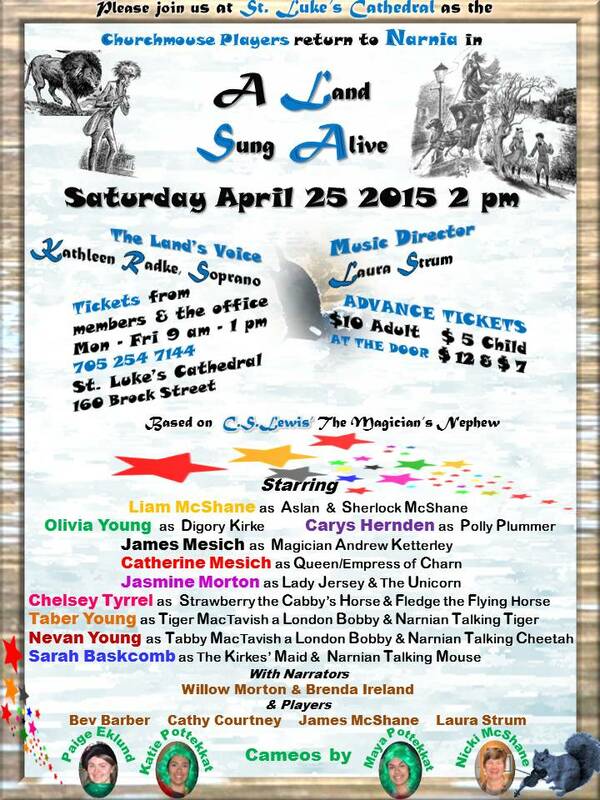 On Saturday, April 25 at 2pm the dramatic production A Land Sung Alive will come to life at St. Luke’s Cathedral in Sault Ste. Marie. As we’ve come to expect from the Churchmouse Players, this production will be a treat for all in attendance. We caught up with Erin Herndon, one of the brave souls behind the creation of A Land Sung Alive to ask her a little bit more about the production. We thank Erin for sharing with us and hope that you will be able to journey to Narnia in A Land Sung Alive. Q. What is the basic story of A Land Sung Alive? What can people expect to see? E.H. The basic story is the creation of C.S. Lewis’ land of Narnia. The bad guys – a bumbling Magician, an evil Empress Witch. The good guys – main characters – 11 year old Digory Kirke and Polly Plummer; a cabby named Frank, the first talking animals, boxing Bobbies, Sherlock McShane, a flying horse, a unicorn, and of course – the great lion, Lord Aslan. Special effects include a blacklight puppet creature which sings Narnia to life with a song which will lift people out of their seats. The core scene features temptation and redemption and it is a favourite scene to rehearse for all involved. This is the sixtieth anniversary of the book our play was based on – The Magician’s Nephew. Q. How long have you been working on the production? E.H. Players were given their scripts in mid-January. Formal rehearsal began in February. Some special effects and scenery were created last year. This past fall, Brenda Ireland has spared no effort in putting our players in authentic late Victorian clothing. Her naiads and dryads (water and tree spirits) are creations to behold. If you want to know what the evil empress is wearing – join us on April 25. Q. What is the range in ages of those involved? Q. How does such a diverse group work together? E.H. All involved are are encouraged to be story tellers and to share their stories. The leap to the stage is a natural progression. In addition, this year we have a goal to support one of our own – one of our teen leaders who is involved with the Me to We programme. Our group has raised hundreds of dollars over the past dozen years for over twenty international, national and local worthy projects. The children help choose the projects – this past Christmas they gave $235 dollars to the Sault’s Humane Society to honour the late author and environmentalist Farley Mowat, and his book The Dog Who Wouldn’t Be. Funds were raised through their play, The Seven Ages Of Mutt. Possibly, most importantly, the script is written for this particular cast – players can ask to have the time commitment for their role shaped to match their schedule for other activities, so they aren’t overwhelmed. Likewise – if they are ready to take on a more complex character – that too is adjusted to reflect their needs and ambition. We have used this technique for a decade and we now reap the benefits as our former shyest children are leading the way – as leaders and actors. Q. Are all the actors from St. Luke’s or are other congregations represented? E.H. We have, in any given year, people from St. Luke’s, other Anglican churches, other denominations and the community at large. Q. Is there anything further you’d like to share? E.H. Tickets are available from members and St. Luke’s Office 705 254 7144, 160 Brock Street, in advance $10 Adult, $5 Children. Performance at St. Luke’s at 2 pm on Saturday, April 25 at 2 pm. Doors open at 1:30 pm. Tickets at the door are $12 and & $7. A reception will follow the performance. Musical Director is the exceedingly talented Laura Strum, who will also perform on at least three different instruments. Sound effects by Caroline Dukes; direction by our entire leadership team which includes Cathy Courtney, Bev Barber, Dean McShane and Penny Tyrrel. Script and production by Erin Hernden. For full cast list – please see our poster. It is said there are no guarantees in life. However, we can guarantee you will be entertained and that you will leave with a spring in your step. Such is the delight and joy of travelling to Narnia. April 16, 2015 in Child & Youth Ministry, Community, Miscellaneous.